In April 2017, real estate developer Heritage Select Homes (HSH) sued Atlanta-based rapper Young Thug, whose real name is Jeffery Lamar Williams, for failing to pay the $2.2 million owed on his $2,475,000 mansion located in the city’s luxurious Buckhead neighborhood. According to the Atlanta Journal Constitution, Williams signed a “balloon promissory note” on the home, which means he’d have a series of large payments toward the end of the repayment period. The lawsuit filed in the state court of Fulton County shows that Williams agreed to make six payments from October 2016 to March 2017, with a portion of each payment going toward the interest and the principal on the note. For example, Williams’s first payment in October 2016 was $86,500 — $16,500 went toward the interest and $70,000 went toward the principal. According to HSH, Williams’ made all the scheduled payments, except for the last and largest one due in March 2017 which amounted to $2,214,667, $2,200,000 of which was for the principal of the home. As first reported Sunday by The Blast, Williams fired back with a counterclaim of his own, which documents show was filed in June, alleging that HSH sold him the $2.4 million mansion knowing that there were a number of structural issues, and that the HSH conspired with his real estate agent to hire an inspector that would lie about the damage. According to the Fulton State and Magistrate Court, the case is ongoing. The full list of complaints, courtesy of Georgia MLS. 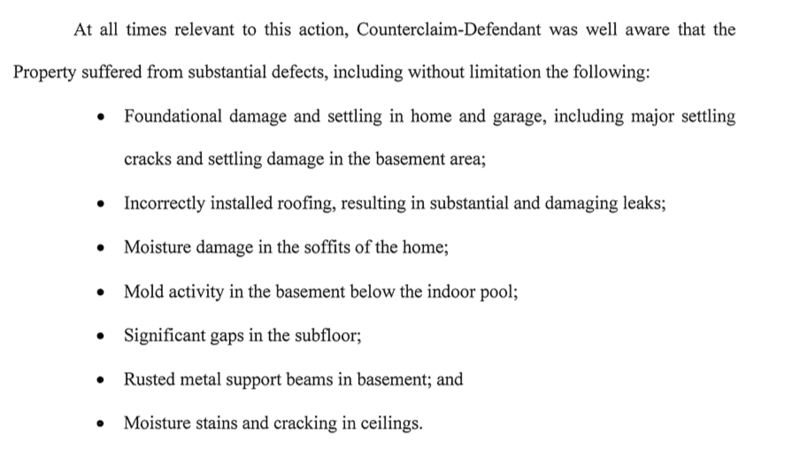 Williams’s lawyers contend that HSH’s and Williams’s former real estate agent’s alleged actions should null the promissory note since Williams originally signed it thinking he was getting a perfectly functioning home.